Help CentreSuperControl AGENCY features Owner set upHow do I select the correct commission model? Do you take a percentage commission? 1. Go to Agency > Edit owners. Click Edit against your selected owner. 2. Scroll down to Payment details and enter your commission percentage. 3. Does your commission rate change throughout the year? If yes, select “Commission rate varies seasonally”. You will have the opportunity to change your commission rate seasonally via the property Price Planner. 4. Enter VAT if applicable. 5. Enter your minimum commission amount. You can leave this field blank if it isn’t required. 6. Enter an Overseas tax charge if applicable. 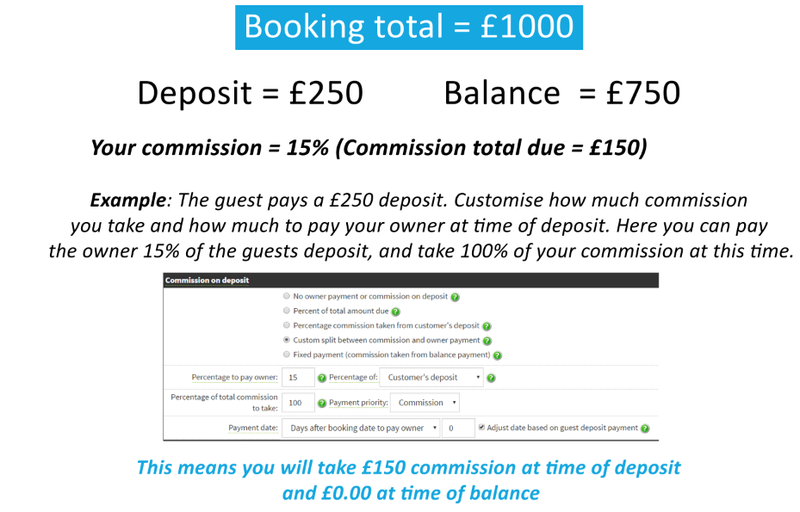 Commission percentage on deposit settings, which one is right for you? When a guest pays their deposit, do you take any commission on that deposit amount? If you take all your commission when a guest pays their balance, tick this option. Set up a fixed amount to pay the owner at time of deposit. All your commission is then collected at time of balance. Commission on balance settings, which one is right for you? No owner payment or commission on balance if you take all your commission at the time of deposit then select this option. Pay owner before arrival date Select how many days prior to arrival the owner should be paid. Pay owner after arrival date Select how many days after arrival the owner should be paid. Pay owner after departure date - Select how many days after departure the owner should be paid. 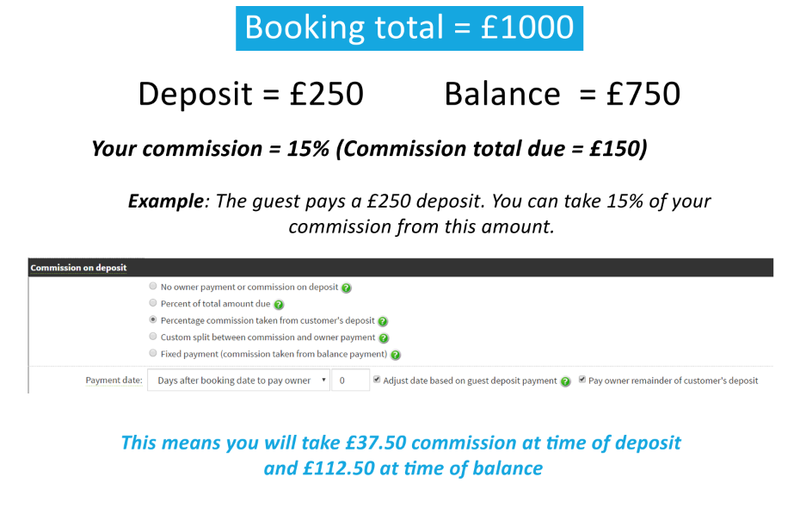 Pay owner after the date of booking - Select how many days after the date of the booking the owner should be paid. Do you take a fixed amount per booking as commission? 2. Scroll down to Payment details and select your Fixed amount option (per day or per booking). 3. Enter VAT if applicable. 4. Enter your minimum commission amount. You can leave this field blank if it isn’t required. 5. Enter an Overseas tax charge if applicable. 6. 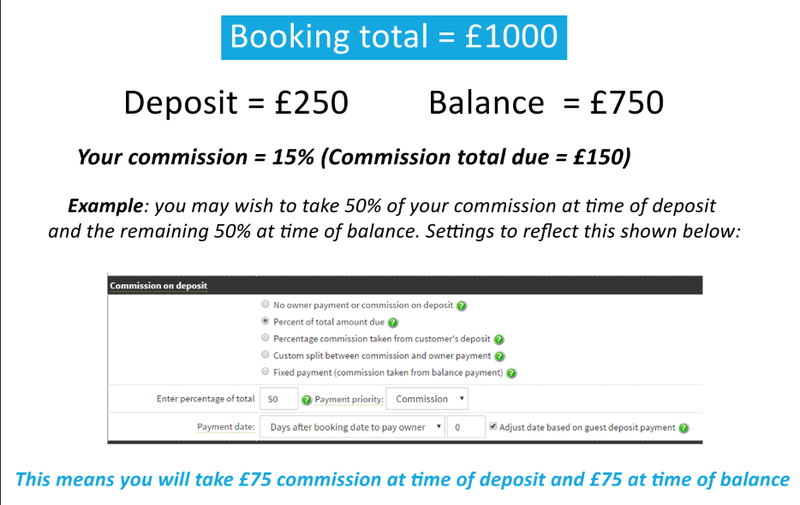 Commission on deposit settings - Select what fixed amount you take at time of deposit. Any remaining amount will be added for commission on balance settings. If your owners are all on the same commission model then you can tick “Save as default commission settings” and your settings will be applied whenever you add any new owners. You can also copy your commission settings to ALL other owners. Prev: How do I edit my owner settings? Next: What commission model should I use if the owner gets paid 100% of the booking?